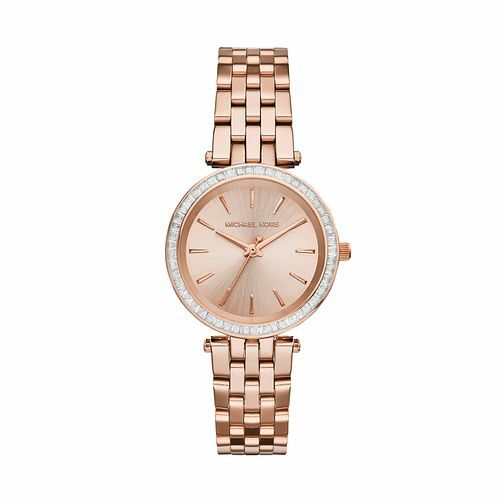 From the glamorous Darci collection, this rose gold tone bracelet watch embodies contemporary style with a jet-set attitude. Featuring a pave stone set bezel for added sparkle and a sleek gold logo-monogrammed dial for an opulent feel, this luxe timepiece is an ultra-feminine finishing touch to every outfit. Michael Kors Ladies' Darci Rose Gold Tone Bracelet Watch is rated 5.0 out of 5 by 2. Rated 5 out of 5 by Anonymous from Perfect I love this product. Im so happy to used it everyday. This watch is very light and comfortable in my wrist. Michael kors is the best . It looks elegant.